Mazco manufactures tool adapters and tapered threaded plugs for stopping gas flow in service tee connections. They are available from 1/4" and up, for threading into concentric holes drilled in the main or perforator type holes in the main. Mazco manufacturers tooling to remove perforators on clamp-on or welded service tee connections and installing these tappping plugs as the initial closure to stop flow. 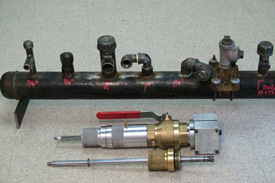 Clamp-on devices can be completely removed from the main line without interupting main line flows. Mazco also manufactures over-drilling tooling for torched or burnt holes in the main, to make them concetnric and allow the plug to be inserted. Contact your nearest distributor or Mazco direct or more information.